1. 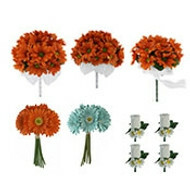 The largest bouquet is perfect for the bride and has 24 peachy Coral open roses with a white bow. These open roses have a gorgeous shape and peachy Coral color. The handle is wrapped with a white sheer organza ribbon and bow. 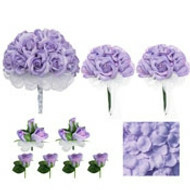 The bouquet measures 8 inches across and 10 inches tall. 2-3. 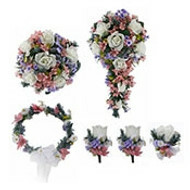 The two smaller bouquets have 12 Coral roses each and measure 6 inches across and 10 inches tall. Each bouquet has a white sheer organza bow attached with lovely trailing ribbons. This white ribbon coordinates perfectly with the larger bouquet. The bouquet stem handle is hand wrapped with green florist tape. These bouquets are perfect for bridesmaids or maid of honor. 4-5. 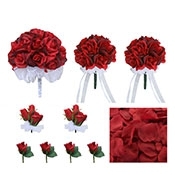 This package includes 2 pin-on corsages. 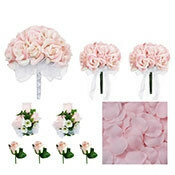 Each corsage has three gorgeous silk peach Coral garden roses accented with several green rose leaves and a lovely white bow. The corsages both come with a pearl head pin for attachment. 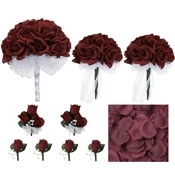 Each corsage measures approximately 4 inches wide by 6 inches long. 6-9. 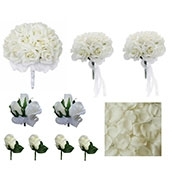 This package includes 4 boutonnieres. 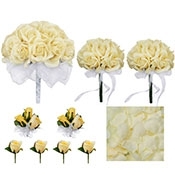 Each boutonniere has a single peach Coral rose with two green rose leaves. The boutonnieres all come with a pearl head pin for attachment. 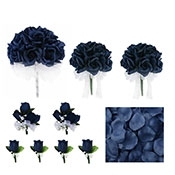 Each boutonniere measures approximately 2 inches wide by 3 inches long. 10. 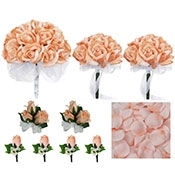 250 peach Coral rose petals are included in this wedding package and they make great table decorations, or aisle accents. 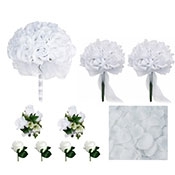 Some brides choose to decorate their honeymoon suite with these romantic accents. A classic and elegant look. Everything shown in this package coordinates exactly with the rest of TheBridesBouquet.com Peach Silk Rose Collection. 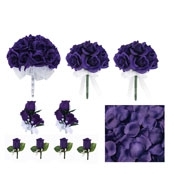 Matching garland, cake flowers, kissing balls and ribbons are also available for purchase.